Give more this Christmas, but keep the packaging to a minimum. Christmas is thought to be the most wonderful time of the year, what with all the time spent with family, the days off from work and school, the ample food and flowing drink, panto and of course all the presents under the tree. The Christmas period can bring a smile to pretty much everyone’s face – except Mother Nature’s. Putting a damper on Christmas is the last thing anyone wants to hear. It’s a time for song and cheer to fill the air in a rather blissful way – but enjoying the season in a more conscientious manner can put things into perspective ever so slightly. The amount of waste we generate throughout the year is significant but the waste we accumulate during the festive season is just too much. There’s no need for statistics, graphs or technical illustrations – all you need to do is remember last year’s Christmas dinner. 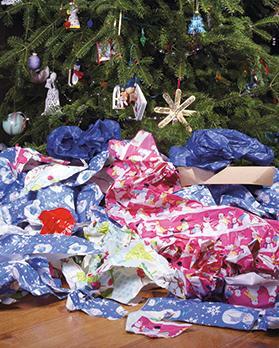 Think of all the leftover food, discarded food packaging, bottles and gift wrapping. That’s all waste and it can very easily be avoided. Just because it’s Christmas Day doesn’t mean we have to overeat, fill our plates to claim what’s ours and stuff our faces till even the top button on our tailored trousers can’t offer more resistance. It’s just a regular feeding day, where food bearers feel quantity is vital. Generally, plates will be filled to an obscene amount, only to pick and choose what’s to be eaten when at the dinner table – a mentality that promotes waste. Take what you plan on eating – if you’re still hungry after you’ve wiped your plate clean, excellent, grab some more. For every serving we waste, and every doggy bag we take home, an element of waste is generated. How many leftover Christmas lasagne portions have you reluctantly taken home from your mother’s house only to throw it all away a few days later? Respect your food this season. Cook and eat what you plan on enjoying for that particular meal, not a week’s worth. Pro-tip: No matter the portion sizes, the dishes will always pile up. Buy a plant-based degreasing soap to help out in the kitchen after all the bellies are full. No toxic chemicals needed on Christmas Day. Christmas shopping is a major perk during the holidays and gets most of your family and friends excited to share the love. A carefully planned out checklist can help you keep everything organised. But this year keep another little token in mind – the packaging. The wrapping of Christmas presents is one of the most magical parts of the festivities. Carefully wrapped with love only to receive a miserable fate where shreds of paper fill the carpeted floor below – there’s so much litter involved. Bags upon bags of recycling that head to the garbage truck the very next morning. A magical hour becomes a burden on our planet. 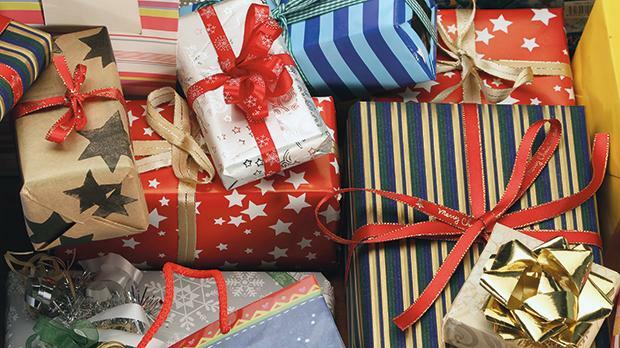 Share gifts, by all means give more this Christmas, but keep the packaging to a minimum. Ask your family and friends what they’re after; get them a gift they want and use recycled material to wrap your presents this year. Get your loved ones to follow suit too. Pro-tip: Take your own tote bags when shopping, refuse the extra packaging in shops, opt for reusable boxes or go for cloth wrapping and use recycled labels this year. If you’re ready to go the extra mile with your gifts this year, why not add some sustainable gifts to your shopping cart? Reusable notebooks, laundry eggs, tote bags, veg bags, a composter, soap bars and other sustainable beauty products, e-books, hemp clothing… you name the category, there’s a sustainable alternative. Give your teenage niece a beauty kit with handcrafted balms, hair products, a bamboo toothbrush and other sustainable items. Gift your nephew the same style box, filled with useful products for his daily manscaping. Give the little ones something crafty that they can reuse, reintroduce wooden toys into their play regime and urge their little minds to understand your choices. For the bigger kids, who although don’t show it as innocently, are even harder to please, get them something useful. Nobody needs that extra scarf or those extra socks the in-laws always receive. Parents: ask your children what their partners want – don’t buy something just for the sake of it. Pro-tip: Get your family and friends to write a letter to Santa. Not only will this get the kids excited but it will also give you the inside scoop on what your closest want for the holidays. Learning how to reduce the amount of waste in our lives is pretty hard when you live in such a consumeristic environment. There are billboards about billboards, trying their best to sell you something you don’t need and very often we fall victim to their manipulative marketing techniques. Finding your own way to keep your Christmas green is the best way to fully achieve a sustainable household for the holidays. You know your Christmas patterns beat after all. Focus on the family, spend some time with friends and remember to keep things green.